The first services of the Episcopal Church held in Mineral Wells were conducted by the Reverend Edwin Wickens of Dallas. Two daughters of the Church, Mrs. Albert Sturdivant and Miss Lu Hoeslay, had come to Mineral Wells from St. Louis, Missouri. They were old friends of Father Wickens, and he obtained permission from the first bishop of the Diocese of Dallas, Bishop Charles Alexander Garrett, to come to Mineral Wells to minister to these women. This was some time between 1895 and 1905. Other like-minded people were found in the community. They included Mrs. Duke of Virginia and her daugher, Mrs. Rose Stevenson; Mrs. Frank Denison of Louisiana; and Ailene De Maret, a young girl whose family owned the Piedmont Hotel. Services were held irregularly, usually in the homes of members, but sometimes in schoolhouses or in rooms over the jail. In 1905 Mr. and Mrs. W. S. McCutcheon moved to Mineral Wells from El Paso. Mrs. McCutcheon was a churchwoman who was very active and deeply interested in the church. Services were held in the McCutcheon basement, called the Catacombs Chapel. A guild was organized, and largely though guild activities and McCutcheon contributions, a church lot was purchased just east of the McCutcheon home. In the summer of 1907 the first Sunday school was organized. A family named Savage moved to Mineral Wells from Corsicana. Mrs. Savage died a few days after their arrival, and Mrs. McCutcheon, visiting them in their bereavement, learned that the children had attended Sunday school regularly. So Mrs. McCutcheon opened her home for Sunday school classes. Mrs. Corene Sharp, Mrs. Savage's sister, came to be with the family, and have been active in her church in Louisiana, began playing piano for the Sunday school. Word of the Sunday school spread throughout the town, and soon adults began to attend. Mrs. Denison brought her daughter, Jeffie. Mrs. Schelcier, who lived in the Period Hotel, came and brought children from the hotel. The Savage children brought other children. Mrs. McCutcheon read, and Mrs. Sharp played, while Mrs. Stevenson assisted with teaching. The first mass was held in a cottage located on the present church lot. The McCutcheons had lived in the cottage while building their home just west of the present church. That home was later owned by the Dennis family and is presently owned by a Dennis descendant, the Hull family. Church furniture was sent from Corsicana for use in this first regularly designated place for Episcopal services in Mineral Wells. There was an altar, altar rail, credence shelf, Bishop's Chair, and some hangings. Later other furniture was added. In 1907 the first confirmation class was held, receiving the laying on of hands from the Right Reverend Garrett. The class numbered seven: Mr. and Mrs. Schelcier, Mr. and Mrs. A. D. Smith, Carrie Stevenson, Emily Folk, and Joe Savage. On the evening of 24 December 1907 the first observance of Christmas was celebrated in the chapel. It was a simple service consisting of Christmas hymns, prayers, and the distribution of gifts from a real Christmas tree. The life of the party was little Miss Minnie Bell Smith. Father Wickens made more frequent visits, and after his retirement the Archdeacon, Reverend Mr. Crittenton, who lived Weatherford, came to Mineral Wells once a month. The guild met regularly in the library of the newly built McCutcheon home and engaged in many activities to raise funds. One such activity the presentation of a play called Bel Shazzar's Feast. After Mrs. Sharp died, Mrs. Mamie Tilotson, who had come from the diocese of Georgia soon after the Sunday school was organized, took over the music for the church. Later her sister, Mrs. Carrie Maples, moved to Mineral Wells and was a most active and faithful church worker. By 1911, the Church began holding services in a building of its own which they called the cathedral. This was a building that Mr. McCutcheon had bought for a workshop, and the churchwomen talked him into using it for the church. The first service in the "cathedral" was celebrated by Father Wickens and Dean Harry T. Moore of St. Matthews Cathedral, Dallas. Father Wickens was a rapid reader, but Dean Moore read much more slowly. The old timers in the congregation read much faster than the newcomers and visitors. The first lay reader was Mr. Fred Burman, an Englishman and loveable character. He also served as the first male superintendent of the Sunday school. Later Mr. Forest Scofield also became a lay reader. When regular services were held, lay readers often assisted each other. While at St. Luke's Mr. Scofield decided to take Holy Orders and was ordained to the Deaconate and to the Priesthood during his residence in Mineral Wells. His first call was to St. John's, Corsicana. In 1914, the congregation purchased the McCutcheon building, and it was converted into a church. A vested choir with a crucifer, young Frank Payne, added a new feature to the services. Mrs. McCutcheon was choir mother. A convocation was held soon after the new place of worship was set to order, and the first communion held there was very impressive as this part of the world had never seen such glorious vestments and altar linens. Also a cross and vases for the altar were given in dedication to Mrs. Sharp and Mrs. Denison. 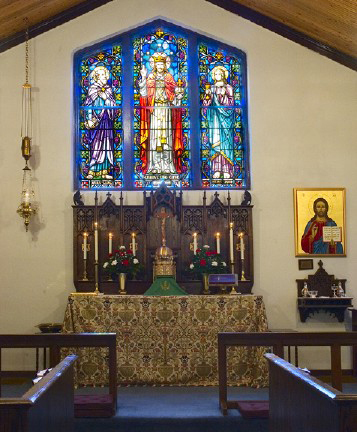 At this time the church, first known as The Church of the Good Shepard Episcopal, became St. Luke's Episcopal Church. Some of the people who were active during these years include Miss Bell Pace, Mrs. McCutcheon's cousin; Mr. and Mrs. J. C. Pangle and a family of four; Mrs. W. W. Johnson and her cousin, Miss Cornelia Crocker; Mr. and Mrs. J. D. Cranford; and Mr. and Mrs. W. R. Williams. Mr. Williams was Senior Warden for years, and he did much for the comfort and pleasure of the parish. He called himself a ‚"pep-tomist, an optimist in action. Dr. Harvey Shields, called Saint Harvey, came to Mineral Wells from New Mexico. He was an invalid. Though not able to minister to the parish, he was always at the service when he was physically able, and once conducted a preaching service that was unforgettable. He died in 1916 and was buried in the McCutcheon plot in Elmwood Cemetery. Mrs. Nina Mills Elliott of Marshall came to Mineral Wells after many years of living in New York. Her interest and activity is well known. Mr. and Mrs. C. L. Fitch and family of Houston spent much of their time in Mineral Wells and were active members and generous supporters of the parish. The first wedding held in the Church, with attendants and a music program, occurred in the winter of 1918 when Miss Frances Young became the bride of Alendander Mullman. The Reverend Edward S. Barlow was the first minister of the church who, with his family, resided in Mineral Wells. He was rector from 1920 until 1923. He was very active in community affairs, a member of the Rotary Club, and chaplain to the Mineral Wells Fire Department. He left Mineral Wells for Weatherford, where he lived until his death in 1944. One of the most beautiful and impressive entertainment affairs of a religious nature to be given in Mineral Wells was an abridged passion play which was presented on the hill in the southwest part of town on Wednesday evening of Holy Week, 1922. It was arranged and conducted by Father Barlow and John C. Miller, assisted by the Guild Auxiliary, the Sunday school, choir, and friends of the St. Luke‚Äôs. It was free to the public and attended by several thousand people. Mr. Miller, when health and time permitted, was an active worker with young people in the church and community. The frame building converted from the McCutcheon cottage had its face lifted twice during its period of service, but in 1930 it gave way to the present brick building. The rector-in-charge during that time was Dr. Claude Beesley. It was he who created and presented to the church the beautiful pieces of carving on the pulpit and altar. The art of carving he learned while a prisoner of war in Germany during World War I. The thirties were lean years for St. Luke's, and for the most part the congregation carried on without a priest-in-charge. Regular services were held, however. These were conducted, for the most part, by George Ritchie, who served as lay reader for many years. Mr. Morgan was the first priest who served the church than this. During his period of service, 1941 to 1944, the debt on the church was paid off, and the pipe organ was purchased. The Parish Hall was acquired in 1948. It was furnished by members of the Guild Auxiliary and many social affairs and church benefits have been held. It was during the ministry of Father Walter B. Clark that St. Luke's became an independent parish. During his stay, 1949-1951, the church was redecorated and the church sign put in place. The Guild Auxiliary, under the presidency of Miss Mabel Wilkinson, did a most attractive piece of Parish Hall improvement. The place was redecorated and refurnished throughout. Mrs. Frank Jones deserves special tribute for this piece of work. A semi-annual bazaar held by these ladies was always a great event. The carpeting of the church and refurnishing of the church office were outstanding pieces of church improvement. Mrs. J. L. Malsby was the leading spirit in this work, as were Mr. and Mrs. Paul Koester. The dedication of the Parish Hall to Mrs. W. S. McCutcheon and to the women who carried on the work in the early days of the church in Mineral Wells was a well deserved gesture. Mrs. McCutcheon's home was used as a parish hall for many years. It has been fittingly said of her that she was a mother, dear, that all who need might find, and truly she mothered the church when such love and care was needed. The church officers in May 1952 were Paul Koester, Senior Warden; Dr. R. C. Jordan; Junior Warden, Pete Zanowiak, Secretary; Gaston Bond, Treasurer; President of the Guild Auxiliary, Miss Mable Wilkinson; President of Altar Guild, Mrs. Eddie Adolph; Head of Sunday School and church nursery, Mrs. Lloyd Bouldin; and Organist and choir director, Mrs. T. E. Hubby. Priests who have served in the intervening years include Father Billie Boyd, Father Walter Beste, Father Jim Johnson, Father James Eanes, Father Paul Rietman, Father Jeff Logan, Father Walter Bennett, Father Jeff Kramer, Father Thomas Kennedy, Father Phil Swickard, Father Andrew Bradley, Father John Phelps, and, presently, priest-in-charge, Father Kendell Felton. St. Luke‚ is moving into the 21st Century with a positive outlook as it strives to minister to the community with outreach projects such as local Girl Scout troops, china painting classes, and fine art classes. The parish has an active Bible study group, an altar guild, and an outreach committee working with the Mineral Wells Center of Life. During school terms, there is a children's Sunday School led by Mary Alyce Buckner. This is a sketch of the history of St. Luke's. If anyone reading this has other information, please contact the webmaster.